We know, we know. The turkey deserves his fifteen minutes. Though it’s only mid-November, the holidays are already on everyone’s mind. And if there’s one thing we love about the holidays, it’s presents! Are you searching for the perfect gift to show employees and clients your gratitude? The best advice we can give you is to find something yummy, useful, or both. Don’t waste your money on something people won’t appreciate. The following are 15 gift ideas guaranteed to please even the bah-humbuggiest of people. Does your business deal with travel, the great outdoors, or perhaps safety? 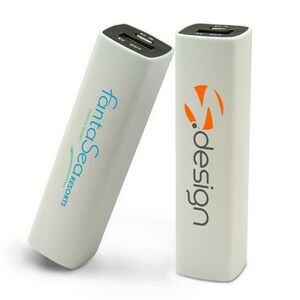 Then these power banks are the perfect holiday gift for your employees and clientele! Available in six colors and with a minimum quantity of 100, starting cost for this trendy tech product is roughly $7 per piece. One step above our power banks is our charger kit. Complete with a car charger, wall charger, and multi-device connector cord, employees and clients will never be without a charged phone. Prices start around $60 for one or $45 each for a quantity of 10. Winter is always the worst for techies. Constantly having to remove your gloves just to use a phone or tablet is a hassle. Fear not! We have a solution for your frozen fingers— text-touch gloves. The option below has a minimum quantity of 50, starts at about $9 per pair of gloves, and is available in black only. 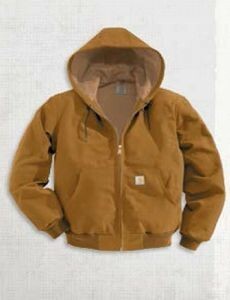 If your employees will be spending their entire day out in the elements, these thermal-lined Carhartt coats are the perfect holiday gift for them. Contact us for pricing, colors, and sizes here. It’s winter. It’s cold. You get the drift. Do your employees spend a lot of time in the wonderful outdoors? Consider giving out these waffle knit beanies for the holidays. With seven colors available, prices start at $11 each for a quantity of 48. Want to go one step further? Consider our basecamp Camping Essentials gift set. It includes a 16 oz. 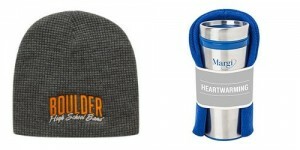 stainless steel tumbler and a custom-embroidered beanie. Prices start at $19 each for a quantity of 50. Speaking of tumblers, why not hand out this beautiful stainless steel mod tumbler? Available in blue, copper, green, red, or silver, prices start at $14 apiece for a quantity of 36. Mod not your style? We also offer this fantastic Godiva Tumbler gift set, complete with a stainless steel/leatherette tumbler, two Godiva bars, and three Godiva gems. Yum! Prices start at $50 apiece for 12 sets. You can also browse our hundreds (literally) of tumbler options here. Give the Gift of Promotional Products!